In the course of tramway works in the city of Eysines in southwestern France, an existing sewer network had to be diverted and extended. The client Bordeaux Métropole chose to realize this challenging project with Hobas GRP pipes by Amiblu. 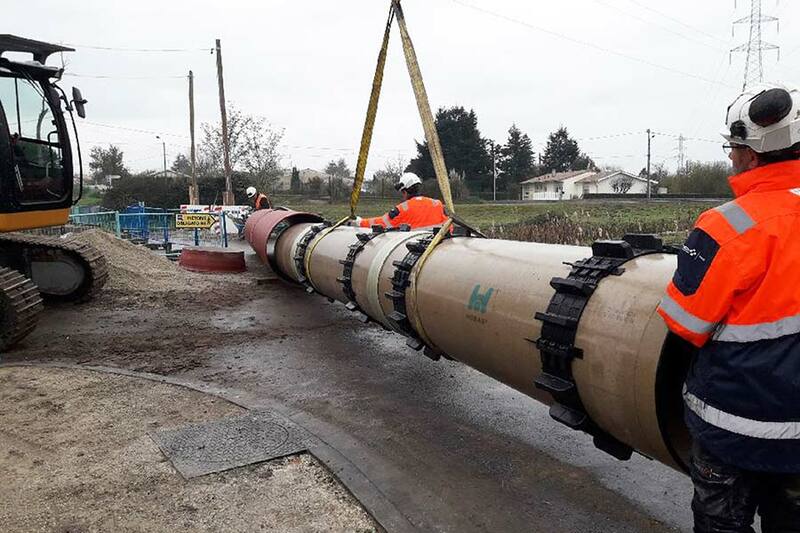 A nearby potable water line, future surface load issues, and pipe route sections with little soil coverage: The circumstances connected to the extension of the sewer system in Eysines (arrondissement of Bordeaux) called for a special approach. The project had become necessary due to planned upgrade works on the Bordeaux tramway network. Together with contractor Sogea-Satom, the client Bordeaux Métropole opted for an Amiblu GRP solution to tackle the challenging installation. Amiblu France supplied 105 meters of Hobas gravity pipes DN 800 as well as four double-manholes consisting of an outside pipe DE 1434 and inside pipe DE 1026. The vicinity of a main potable water line called for special safety measures like double pipes: Any chance of the sewage affecting the drinking water had to be prevented. 50 meters of the sewer line were additionally equipped with distance rings and encased in cast iron to protect the GRP pipes against high surface loads – the soil cover height was only 40-50 cm in this section. The GRP manholes were connected to the sewer pipeline by means of Straub couplings. Now that all pipe infrastructure works have been completed, the tram line extension can be safely completed with operations scheduled to start in 2020.